Now the plague is receding, and Americans are busy rebuild�ing civilization under orders from the provisional govern�ment based in Buffalo. Their top mission: the resettlement of Manhattan. Armed forces have successfully reclaimed the island south of Canal Street -- aka Zone One -- but pockets of plague-ridden squatters remain. While the army has eliminated the most dangerous of the infected, teams of civilian volunteers are tasked with clearing out a more innocuous variety -- the "malfunctioning" stragglers, who exist in a catatonic state, transfixed by their former lives. Mark Spitz is a member of one of the civilian teams work�ing in lower Manhattan. Alternating between flashbacks of Spitz's desperate fight for survival during the worst of the outbreak and his present narrative, the novel unfolds over three surreal days, as it depicts the mundane mission of straggler removal, the rigors of Post-Apocalyptic Stress Disorder, and the impossible job of coming to grips with the fallen world. 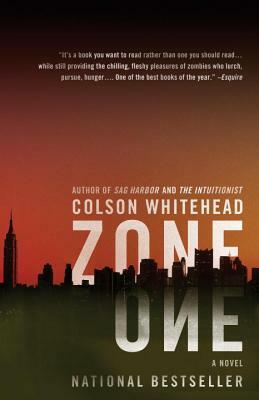 Both spine chilling and playfully cerebral, Zone One bril�liantly subverts the genre's conventions and deconstructs the zombie myth for the twenty-first century.